In this previously dark and cavernous loft, two architectural structures are oriented perpendicularly to each other to frame the living spaces and create privacy for the bedrooms. These free-standing cores are articulated with a lower datum of overlapping solid stock wood planks. The upper datum is a continuous glass skin that gives volumetric definition to the light. The structures contain the bathrooms, storage spaces & kitchen and act as beacons in the space; they activate the ceiling plane and connect the flow of light in an otherwise dark interior. At certain moments along the lower datum, the wood planks become operable and allow light and air to pass through. The planks adapted to the needs of the room they conceal: providing additional light for the bathrooms or ventilation for the large kitchen pantry. The kitchen is defined by a 24-foot long ‘work station’ that accommodates washing, cooking, preparation and dining activities. Additional storage, appliances, and counter space are imbedded into the face of one of the cores. The kitchen, visible from all of the public living zones, was intentionally designed to be the central focus of the family’s lifestyle. A partition system of shingled glass screens the master bathroom and study from view while letting light exchange from adjacent rooms. 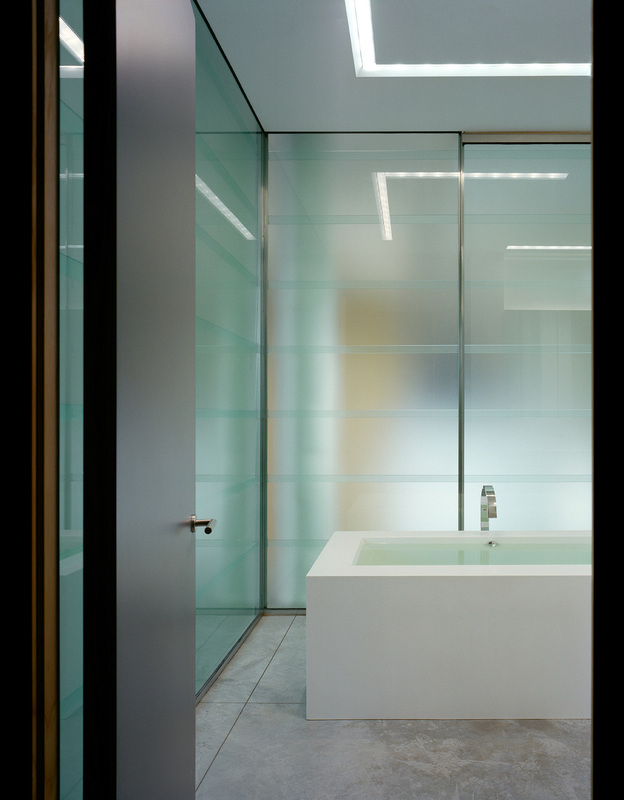 The horizontal bands of glass catch the light and subtly diffuse it into the internal spaces. 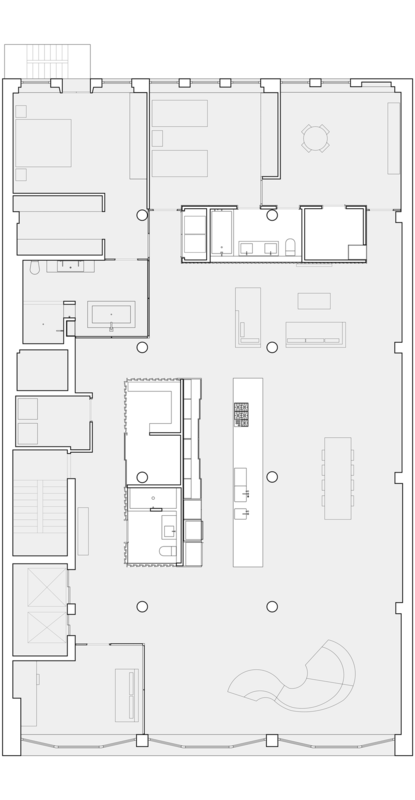 The children’s bedroom, playroom, and children’s bathroom were designed as a suite of connected zones which can accommodate large play groups without disturbing the activities taking place in other parts of the loft.